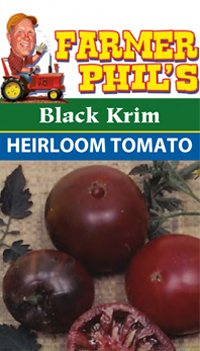 Black Krim tomatoes, an heirloom variety from Russia, aren’t always black. Typically, they turn a dark brown color but will darken more when the weather becomes hot. At a larger size, this variety of tomato is about 10 to 12 ounces and has a somewhat salty flavor. Each plant produces a large amount of fruit and takes 75 to 90 days to mature. When adding these, remember to make 24 to 36 inches of space between each plant in your garden. Exposure: Full sun. Plant after danger of frost. Water Needs: Keep plants evenly moist. Fertilizer: Fertilize at planting and again as flowers develop.